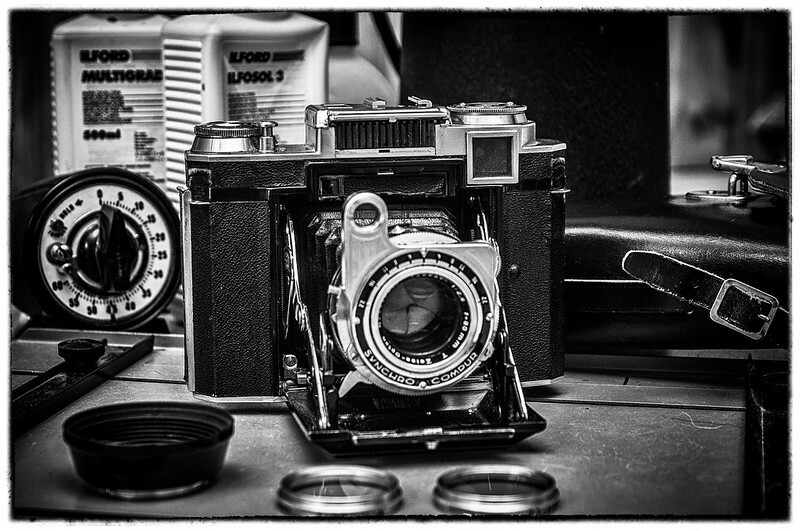 Do you find the rangefinder accurate enough to use the lens wide open at 2.8? I've had the lower echelon Netter 6x9 w. Novar for a while and find the images very pleasing. So much so that over the last month I've picked up a Super Ikonta A (lens dates to 1934), and a Super Ikonta II C (around '37). Haven't developed any film yet though. If anyone knows where to find a replacement spring for the front standard of the Albada finder on the "A" please let me know! Here's a picture of the "A" next to a Minox to show scale, a 645 that literally fits into your jeans pocket ain't a bad thing. At 79 years old (the camera, not me), the only problem I have is that broken spring on the finder (it broke right after I took this shot :-( so I have to hold it up with my index finger.